Set up navigation to link the pages that you have developed to your portal, as described in the following sections. 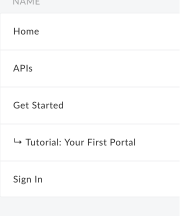 Set up and publish the navigation menus in your portal using the navigation menu editor on the Menus page. 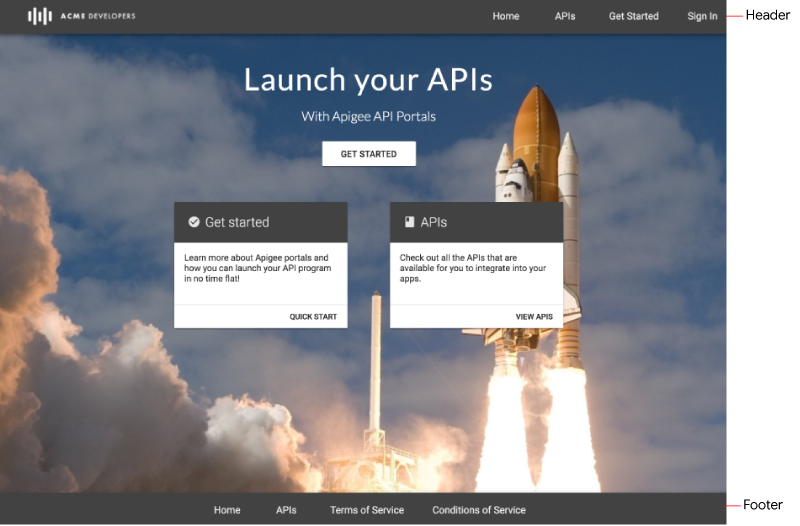 Select Publish > Portals in the side navigation bar, select your portal, and click Menus on the landing page. When editing your portal, select Menus in the drop-down menu in the top navigation bar. Two navigation menus are provided by default: Header and Footer. The default navigation menus appear in and link to the set of starter pages provided, as shown in the following figure. You can add a maximum of 200 menu items. Select the menu that you want to edit in the drop-down list (Header or Footer). Click Publish to publish your changes to the live portal. Select the menu that you want to edit in the drop-down list. Position your cursor over the menu item that you want to move to display the actions. Click and hold the mouse button over , to the left of the menu item name. Drag the menu item to its new location in the menu item list and release the mouse button. A submenu displays as a drop-down menu when you overlay the parent item. Add a menu item that will serve as the parent menu. Add additional menu items that will serve as the submenus. Rearrange the submenu items so that they are under the parent menu in the desired order that you want them to appear in the menu. To move a submenu item back to the top-level menu hierarchy, click . Position the cursor over the menu item that you want to edit and click . Edit the menu item details. Select the menu that you want to publish from the drop-down list. Click Publish to publish the navigation menu. Select the menu that you want to edit from the drop-down list. Position your cursor over the menu item in the list to display the actions menu.